The Land Potential-Knowledge System (LandPKS; landpotential.org), a joint USAID-USDA program, is creating mobile applications that help land managers collect, store, and analyze data in order to inform decision making, agricultural production, and vegetation monitoring and restoration. It does this through the use of the LandPKS Mobile app, which is free to download and use for both Android and iPhone. The LandPKS app currently has two modules: LandInfo and LandCover. The major goal of the LandCover module is to assist users with collecting vegetation cover data using a point-intercept method. 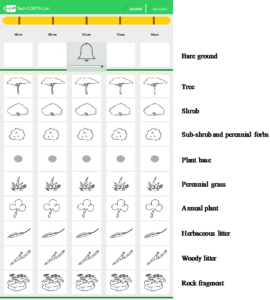 LandCover is designed to be a simple, user-friendly substitute for traditional paper monitoring sheets for vegetation cover. The only equipment needed is a meter/yard stick and the LandPKS app installed on a smartphone. First, the user designates a center point of the plot. Next, the user walks 5 meters/yards in one direction from the center, drops the stick, and enters which vegetation types directly touch the stick at 5 points along the stick, measures plant height, and establishes if there are canopy or basal gaps. This is then repeated at 10, 15, 20, and 25 meters/yards along that given transect. Lastly, this process is repeated in the 3 remaining transect. Overall, this method yields 100 points of vegetation cover data per plot in about 20 minutes. Screenshot of the LandCover data entry screen and the different types of cover that are collecting with the LandCover module. Importantly, results are calculated immediately on the phone about cover type, plant cover, canopy height, and gaps. In addition to receiving results on the phone, users can also access their data on our open-source data portal at portal.landpotential.org. Further, a user can enter vegetation cover data for the same plot at various intervals and immediately get results about trends in vegetation cover. LandCover can be used globally, and the module is currently being used extensively in the rangelands of Namibia and Kenya. There are several important advantages of using the LandCover module for measuring vegetation cover. First, it gets rid of paper forms that can be lost or damaged. Second, results are delivered immediately to a user without the need for extensive data analysis. This benefit was mentioned by rangeland managers in Samburu County, Kenya, who told the LandPKS team that now they can see results directly on the phone themselves, instead of waiting months to maybe get results back from their headquarter offices. This makes it easier and more efficient for real-time vegetation monitoring and decision making. Third, the LandCover module makes vegetation restoration efforts easy to monitor. This has important implications for both maintaining wildlife habitat and encouraging the growth of fodder species for livestock. Lastly, the LandCover results help natural resource managers make more sustainable decisions about their land, which can lead to greater productivity and less environmental degradation. Download the LandPKS app to try out the LandCover module today! For more information about LandPKS please visit our website at landpotential.org or e-mail us at contact@landpotential.org.